Specimen of an unidentified Rhogeessa, photographed by Kate Comis. The Neotropical members of the genus Rhogeessa go by the incredibly imaginative vernacular name of 'little yellow bats'. On the face of it, this would seem to sum up the salient features of these animals pretty succinctly: they're small, they're yellow, and they're bats. Eleven species of Rhogeessa were recognised by Baird et al. (2008a), found from northern Mexico to southern Brazil. The species of Rhogeessa are rather difficult to distinguish from each other; in particular, the six species that referred by Baird et al. (2008a) to the 'Rhogeessa tumida complex' are all but indistinguishable. Nevertheless, recent authors have regarded them as good species, and it is because of the reasons why this is that the genus has attracted the most interest. The only really reliable way to distinguish the species of the R. tumida complex is to take a look at their chromosomes. Despite their external similarity, the species have different chromosome numbers and arrangements from each other. This forms an interesting contrast to other bat genera, which may have more morphological variability but little chromosome variation. Comparison between Rhogeessa chromosomes has lead to the suggestion that the various species may have diverged as a result of a process called Robertsonian translocation. Specimen of the Yucatan yellow bat Rhogeessa aeneus photographed by Alex Borisenko. To explain Robertsonian translocation, I have to indulge in a bit of background terminology of chromosomes (skip this if you know all this stuff). Think of the classic picture of an X-shaped chromosome (this is actually a doubled chromosome that develops during cell division: two copies, called chromatids, have been produced of the chromosome that will be separated when the cell divides). The point where the two chromatids are joined is a region of the chromosome called the centromere: it provides an attachment point for the spindle fibres that will draw each individual chromatid apart. The centromere is not always positioned at the midpoint of the chromosome: those chromosomes in which it is are called metacentric, while other acrocentric chromosomes have the centromere close to one end so the conjoined chromatids look closer to V-shaped than X-shaped. Robertsonian translocation has been observed in many species; it even happens occasionally in humans. Where it becomes interesting for evolutionary studies is that the resulting metacentric chromosome continues to function in the same manner as the original acrocentric chromosomes, with little or no negative effects (the short bit from each acrocentric chromosome that is lost rarely contains any functioning genes). The individual carrying the fused chromosome even remains fertile, because when meiosis occurs in any individual with both the fused and unfused chromosomes, the two unfused chromosomes will each line up with their matching arm on the fused chromosome. However, imagine a situation where one individual in a population experiences a Robertsonian translocation between two chromosomes (call them 1 and 2), but another individual has a translocation between one of those chromosomes and another chromosome (say, 2 and 3). The individual that carries chromosomes 1-2 and 3 will produce fertile offspring if mating with an unfused individual, as will that carrying 1 and 2-3. However, if the 1-2 individual mates with the 2-3, their offspring will carry both fused chromosomes. Because these chromosomes and the unfused 1 and 3 cannot easily match up in a way that allows them to be separated effectively during meiosis, the hybrid offspring will have significantly reduced fertility. This has been practically shown to be the case between Robertsonian races of mice (Capanna et al. 1977). If the two fused chromosomes each become more predominant in a population than the original unfused chromosomes (either by drift or hitchhiking), then gene flow will be slowed or stopped between individuals carrying one or the other. Hey presto, speciation! Speciation as a result of Robertsonian translocation also provides a counter-example to those who, when objecting to the taxonomic recognition of 'cryptic' species, raise the Biological Species Concept to defend their viewpoint. Contrary to popular assumption, there is no essential correlation between speciation and morphological divergence. Even under the Biological Species Concept, two populations may be good species (i.e. non-interfertile) and yet morphologically indistinguishable. 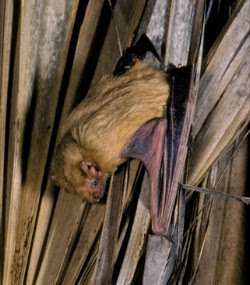 Allen's yellow bat Rhogeessa alleni, photographed by Merlin Tuttle. Rhogeessa alleni is the most morphologically distinct species of Rhogeessa, and has been included in a separate genus or subgenus Baeodon. Baird et al. (2008a), on the basis of molecular phylogeny, recognised the subgenus Baeodon but also including R. alleni's sister species, R. gracilis. Anyway, I have a vague memory that somewhere along the line I was talking about bats. The known karyotype numbers for Rhogeessa vary from 30 (in three species: R. alleni, R. gracilis and R. io) to 52 (in a specimen from Suriname that Baker et al. 1985 assigned to R. tumida but which almost certainly represents an undescribed species). The phylogeny for the genus that was recovered by Baird et al. (2008a, b) could be consistent with both Robertsonian fusions and fissions taking place during the genus' history. In an attempt to test whether the different karyotypes truly function as isolating mechanisms (and hence whether the chromosomal 'species' are actually species), Baird et al. (2008b) could only find genetic indicators of possible recent hybridisation between the two apparently least divergent species, R. tumida (34 chromosomes) and R. aeneus (32 chromosomes); all other species maintained reciprocal monophyly in each of the three gene types (mitochondrial, Y-chromosome and somatic chromosome) tested. Baker et al. (1985) referred to another 32-chromosome karyotype ('32N') that differed from R. aeneus (assuming, on the basis of geography, that R. aeneus corresponds to Baker et al. 's '32B') in terms of exactly which chromosomes had been fused and so would be reproductively incompatible with R. aeneus. However, this 32N form appears to be assigned by Roots & Baker (2007) to R. io, otherwise with 30 chromosomes. As 30-chromosome R. io and the 32N form differ only in a single pair fusion in the former (Baker et al. 1985), they would probably remain interfertile by the principles described earlier. In contrast, despite their apparent difference in chromosome number of only two, R. tumida and R. aeneus actually differ in five chromosome fusions (three on one side, two on the other), meaning their interfertility should be considerably lower. 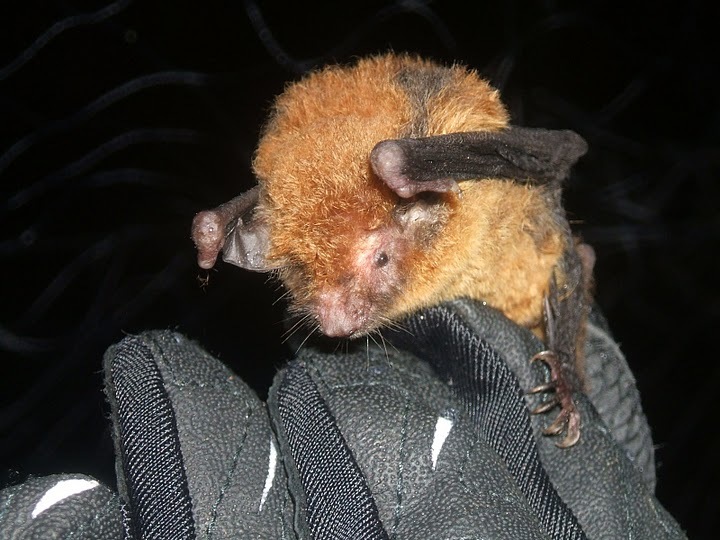 And if you've gotten this far and you're still not sick of bats, Darren Naish covered Rhogeessa and its relatives as part of his mammoth series on vesper bats earlier this year. Baird, A. B., D. M. Hillis, J. C. Patton & J. W. Bickham. 2008a. Evolutionary history of the genus Rhogeessa (Chiroptera: Vespertilionidae) as revealed by mitochondrial gene sequences. Journal of Mammalogy 89 (3): 744-754. Baird, A. B., D. M. Hillis, J. C. Patton & J. W. Bickham. 2008b. Speciation by monobrachial centric fusions: A test of the model using nuclear DNA sequences from the bat genus Rhogeessa. Molecular Phylogenetics and Evolution 50 (2): 256-267. Baker, R. J., J. W. Bickham & M. L. Arnold. 1985. Chromosomal evolution in Rhogeessa (Chiroptera: Vespertilionidae): possible speciation by centric fusions. Evolution 39 (2): 233-243. Capanna, E., M. V. Civitelli & M. Cristaldi. 1977. Chromosomal rearrangement, reproductive isolation and speciation in mammals. The case of Mus musculus. Bolletino di Zoologia 44 (3): 213-246. Roots, E. H., & R. J. Baker. 2007. Rhogeessa parvula. Mammalian Species 804: 1-4. FYI - here is a comment from a bat specialist, to whom I sent the link to this post: "nice story - though I'm sure that the flying bat picture is the wrong species name on it. Looks like it has a nose leafe on the face which would make it in a different family from the genus he's talking about.... but it's low resolution so hard to see for sure." Thanks a lot for pointing that out, Vazrick. Just to be safe, I've removed the debatable picture and replaced it with something that seems more reliably Rhogeessa (fingers crossed). What is the 'general' chromosome number in bats, if any generalization is possible? I don't know what the range is like for bats in general, but Baker et al. 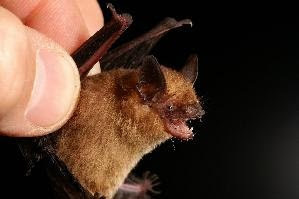 (1985) indicate that, among other vespertilionids, Eptesicus fuscus has a chromosome number of 2n = 50, while the more distantly related Myotis has 2n = 44. If two mutually incompatible fused karyotypes are found in a population together with an unfused version, presumably the fused versions would be selected against as they're less likely to have grandchildren than unfused ones, right? Are these translocations just so common in these bats they sometimes reach fixity despite negative selection, or is there something else going on? The article on mice by Capanna et al. (1977) did discuss this hurdle, though of course their suggestions were all just hypothetical. Fixity may be more likely in a small peripheral population. Also, if the fused chromosomes were carried by a socially dominant individual, that individual might dominate breeding despite its handicapped fertility rate.